Some protests turn violent n Cops, 6-year-old girl injured n Schools, colleges, shops, markets remain shut n Protesters block Expressway, highways. Pimpri-Chinchwad and Pune district on Thursday observed what the Maratha Kranti Morcha leaders described as a “spontaneous bandh” to press for their demand for reservation in government jobs and education. Despite an appeal by Morcha leaders to keep the protests peaceful, incidents of violence were reported from some places, including Chandni Chowk and the District Collectorate, but there was no loss of life. Since Thursday morning, groups of Maratha agitators took out rallies in key city areas, holding saffron flags and raising slogans in support of their demands. They forced shops, hotels, banks and even IT companies to down their shutters. At Chandni Chowk in Kothrud, protesters attacked a police vehicle and pelted policemen with stones. Police resorted to lathicharge and also fired teargas shells to bring the situation under control. As the protesters blocked roads going through Chandni Chowk, the flow of traffic on the Pune – Bengaluru Highway was disrupted. At least three police personnel were injured and a police vehicle was damaged in the violence. A six-year-old girl was also injured by a teargas canister during the violence. The girl, Aayesha Jakati, is a resident of Lokmanya Vasahat near Chandni Chowk “As per our primary information, the girl was injured after a fired canister was picked up by a protester and thrown away… it hit the girl. I have spoken to the doctor treating the girl. The injury is in the form of a laceration and it is not grievous,” said Sengaonkar. At the District Collectorate premises, a few protesters damaged lamps, window glasses and the cabin of security officials. Earlier in the day, hundreds of protesters had gathered outside the District Collectorate from different parts of the city to participate in a sit-in agitation. District Collector Naval Kishore Ram said some miscreants went on a rampage after he accepted a written representation from leaders of the agitation. A group of people barged inside the building and refused to leave the premises. Some protesters even manhandled mediapersons and photographers at the spot. A large police team was deployed in the area to keep the law and order situation under control. Till late in the evening, police officials held discussions with the group of protesters, trying to convince them to leave the premises. Some protesters, who did not leave the District collectorate premises, demanding apology from mediapersons, were detained by police after mild lathicharge around 8.30 pm. “Barring some sporadic incidents, mainly one at the District Collector’s office and another at Chandni Chowk, the overall bandh in Pune city was peaceful. At the Collectors’s office, the glasses of a security cabin were broken.. and some protesters entered the office premises. Our officers and personnel present at the spot held discussions with the protesters and brought the situation under control,” said Police Commissioner K Venkatesham. Protesters pelted stones at the Saraswat Bank in Somwar Peth , forcing the staffers and guards to pull the shutters down. The protesters also damaged a few vegetable stalls at the Sitaram Thopte market in Somwar Peth. All shops on Laxmi Road, the main market area in the city, remained closed as protesters took out a rally there. The situation gradually returned to normal and shops and market places opened for business after 6 pm. 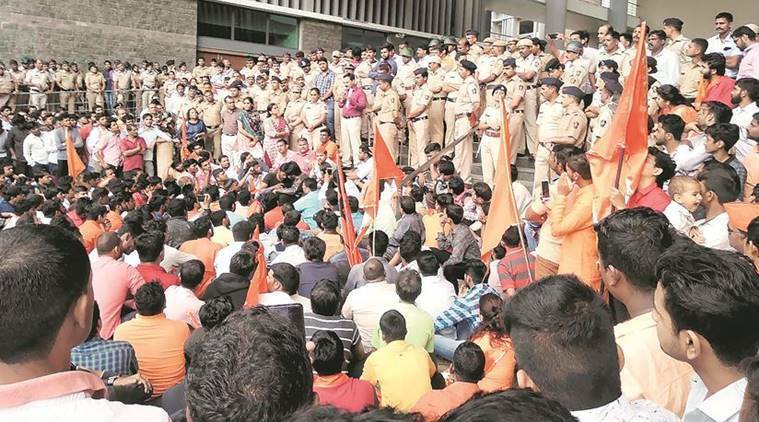 A group of Maratha agitators barged into Hyatt Regency, a five-star hotel on Pune-Ahmednagar Road, around 2 pm on Thursday. The protesters reportedly disrupted a conference inside the hotel. R K Malhotra, one of the guests at the hotel, said, “A conference organised by our company was going on. It was lunch time when a mob of over 100 persons barged inside the hotel, vandalised the reception and manhandled us. They wanted to stop the conference. My cell phone was damaged in the process. I have asked the hotel to provide me CCTV footage of the incident. A Pune Police team visited the hotel after receiving information about the incident”. Groups of Maratha protesters also organised rallies in city areas where several IT companies are located. They barged inside at least three IT companies, at Senapati Bapat Road, Hinjewadi I T Park and Aundh, shouting slogans. In the suburbs of Pune, Maratha activists took out rallies in support of the demand for reservation. Markets and shops remained closed, and autorickshaws and public transport remained off the roads. A group of students took out a rally in support of the Maratha agitation inside the Savitribai Phule Pune University campus. However, the eatery inside the university was open for students. Hospitals, medical shops and emergency services were functional. Schools, colleges and most offices in the city remained closed. While the protests in Pune rural areas were peaceful, the situation remained tense. On Thursday morning, police suspended Internet services in seven talukas of the district — Baramati, Khed, Junnar, Shirur, Daund, Maval and Bhor. Heavy police deployment was seen in Chakan and police used drone cameras to monitor the activities of protesters in the industrial area, where violence had broken out last month during a similar agitation. Internet services were restored in the talukas in the evening. Protest rallies were organised at different locations across the district. Markets, shops and hotels were shut in most parts of rural Pune. During a protest in front of the residence of NCP chief Sharad Pawar in Baramati, his nephew and MLA Ajit Pawar also joined the protesters and shouted slogans with them. A police team was deployed at the spot to prevent any untoward incidents. Traffic on the Pune-Mumbai Expressway was blocked for over six hours at the Urse toll booth. “Protesters stopped the traffic at the toll booth around 11 am. Though the number of vehicles was fewer compared to average traffic on a weekday, rows of vehicles were seen lined up on the Expressway, till the time traffic was diverted towards the Old-Pune Mumbai Highway. The traffic on the Expressway went back to normal around 5 pm,” said an official from the State Highway Patrol control room. “On other highways, including Pune-Solapur, Pune-Ahmednagar and Pune-Nashik, traffic was halted briefly, when protesters submitted their representations to government officials,” added the official. In Lonavala, the protesters staged a blockade on the railway line between Pune and Mumbai in the afternoon, which delayed some trains. At 5 pm, protesters blocked roads in Kothrud and Deccan, causing traffic jams. State transport buses from Pune station, Shivajinagar, Swargate bus depot didn’t ply for the better part of the day. PMPML buses also remained off the roads after 10.30 am.